You hear a lot said about both higher attendance and lower ticket prices in the Bundesliga (BL) compared to the English Premier League (EPL). The problem is that much of this is based on anecdotal or partial evidence. So here I take a look at the most general data I can find and see what is going on. I think this picture is quite different from the one that is normally painted. I’m going to look at the 15 seasons from 1996/97 to 2010/11. Attendance data is relatively easy over any period, but price data is more tricky. You see prices paid for particular games or particular seats/standing spaces in a given stadium, but it’s obviously dangerous to make inferences from partial data. The fact that clubs increasingly charge different prices for different games and different seats makes it hard to get the full picture. More on this below, but first, attendance. It’s also worth commenting on the pattern of change over the last 15 years. 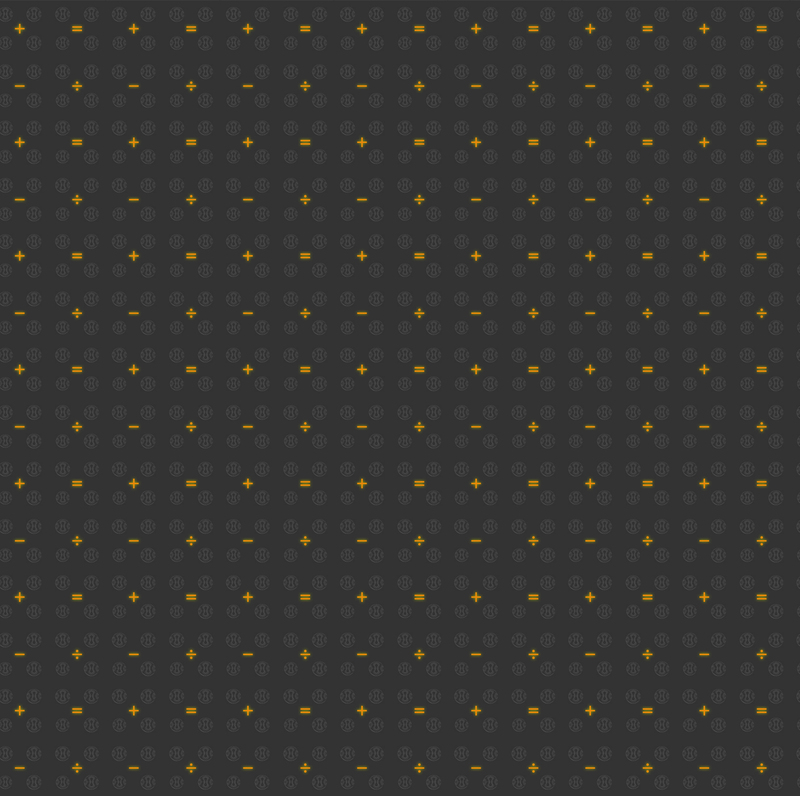 Both the EPL and BL play to sell out crowds for most games. The pattern of attendance growth largely reflects increasing capacity. In England the 1990s was a period of large capacity increases as clubs invested- initially because of the Taylor Report requirements and with some public funding, but mostly in the latter years because of the football boom in England and privately funded. Capacity in the BL grows significantly in 2000s largely because of the investment for the 2006 World Cup- some of which was publicly funded. It would be interesting to make a comparison of the size of public investment in stadium capacity in each country. This is not simple, since the infrastructure around the stadium is often as important as the stadium itself. From this you might gain the impression that ticket prices are two to three times higher in the EPL. But clearly this depends on exactly how many people get to pay these prices, as well as how much everyone else pays. It’s a standard business ploy to advertise a small number of very low prices in order to give the impression that the typical price is low, when in reality most people may be asked to pay a much higher price. In terms of how the clubs treat the fans as a whole, the best guide must be the average price paid (some analysts might argue for the median price, which might give a better idea of the typical price paid- but we just don’t have that data). We can get an approximation for the average price paid from the Deloitte’s Match day Income (MDI), which they have published for the EPL and BL from 1996/97 to 2010/11. Comparing MDI is complicated because of the exchange rate, not least the move from the DM to the Euro in 1999. To make comparisons Deloitte express everything in euros and have made different exchange rate assumptions in different seasons. So I converted the Deloitte data for the EPL back into sterling using their assumptions, and then converted the BL data into sterling using the relevant DM or euro exchange rate on June 30 in each year. Whichever way you cut it, (a) MDI is higher in the EPL than in the BL but (b) has grown far faster in the BL than EPL over the last 15 years. Clearly if you express the change in sterling the relative increase is even greater – which simply tells you that you need to be very careful about exchange rates. 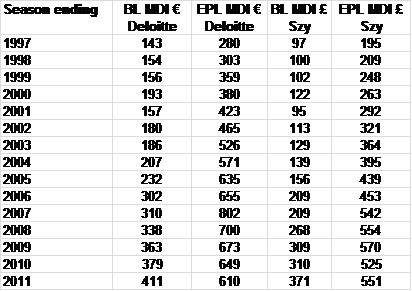 In any case, this is all preliminary to our real interest which is in the average revenue (MDI) per fan. Now, I’m going to divide total MDI by league attendance – had I the time I could figure out total attendance by adding in Cup games – domestic and European – but since I haven’t, how will this bias my results? Total attendance must be higher, so the figures will overstate average prices. There is also a bias in that English clubs play more games on average- because in addition to the FA Cup they also play the League Cup and I’m guessing more fans attend the FA Cup than the DFB Pokal. It probably doesn’t make much of a difference, but it’s worth bearing in mind that the estimates are slightly biased against the EPL. separately. I’m guessing the percentage of MDI from these sources will not be very different comparing the BL to the EPL, so this is not likely to bias in the results. I am using the sterling value only because sterling existed as a currency in every season (unlike the DM and Euro)- but since I have converted at the 30 June exchange rate in each year the figures are comparable (e.g. if you had gone from the UK to Germany to watch a game in 1997 then £11.01 should have been enough to buy an average ticket, assuming you got the 30 June 1997 exchange rate). We can now compare average cost per fan of going to games in each year using a common currency. I think a lot of people will be surprised when they look at this table. MDI per fan has been consistently higher in the EPL, but the gap has been narrowing sharply. The first two columns show the average revenue per fan in the BL and EPL – in both countries this has more than doubled, but the rate of increase has been faster in the BL than in EPL. 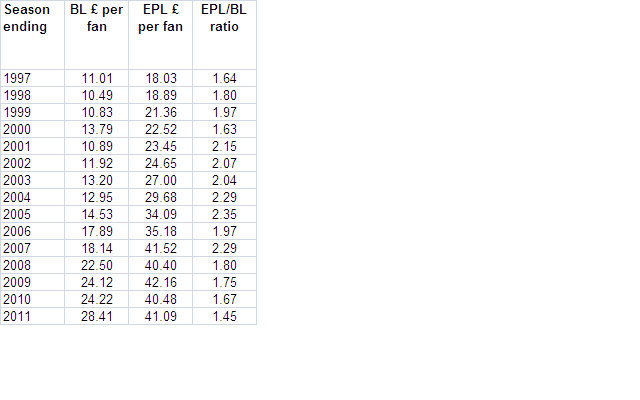 Back in 1997 the average revenue per fan was 64% higher in the EPL than the BL, while by 2011 it was only 45% higher. These comparisons have been made by converting to a common currency. But a large part of the fluctuations in these prices have been caused by exchange rate movements, so this might be considered misleading. If you live in Germany and earn a living in Euros then the rate of change of prices in Euros will be the relevant consideration. Changes in prices over time have also reflected the falling value of both sterling and euros. If, for example, you had £11.01 in 1997 and held onto it until 2011 you would discover that it would buy a lot less in the UK- everything has become more expensive. Inflation in the UK eroded about one third of the value of £1 between 1997 and 2011, and so if we want to compare prices in the past to prices today, we really should take account of this. Allowing for inflation in the UK the average price per fan has risen much more slowly- only a 50% increase. However, had you taken your £11.01 in 1997 and converted it to DM, then into Euros in 1999, and held onto it until 2011 then its value would have eroded far less- only by about 20%. That means that the price increases in Germany have less to do with simply keeping up with inflation, and more to do with real price increases. 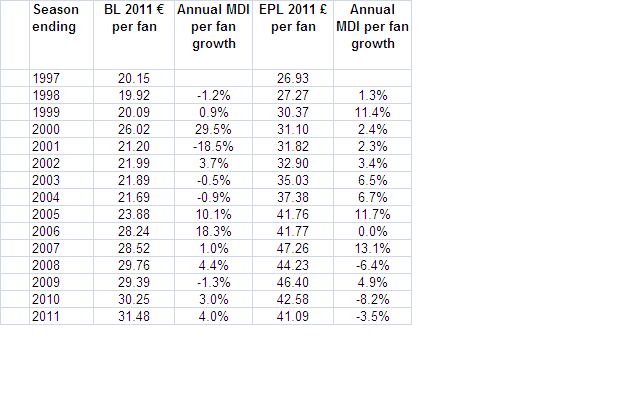 To illustrate the real growth in ticket prices I have inflated the EPL MDI per fan using the UK Retail Price Index, and the BL MDI per fan in Euros by the German Consumer Price Index. There are some significant fluctuations from year to year, but comparing 2011 to 1997, MDI per fan has increased in the BL slightly faster in local currency terms over the last 15 years, by 56% compared to 53% in the EPL. These results are so contrary to the prevailing narrative in the British press that I’m sure lots of people will think that I’ve fixed the numbers in some way or other, so I’m attaching the spreadsheet I made (BL-and-EPL-calculations) which also lists the sources I used (if you can find an error then please contact- no one is infallible- thanks already to Roger Pielke for pointing out some issues). It’s especially important to note that this analysis rests heavily on the accuracy of the Deloitte data. Also, let’s apply some basic “smell tests” to see if the data makes sense. First note that average prices are still around 50% higher in the EPL, the point is just that the BL is quickly catching up. 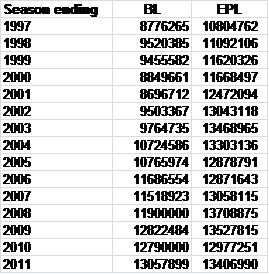 Second, note that the data can really be divided into two periods- 1997-2004ish and 2004ish-2011. In the first period BL prices barely increased in real terms, while EPL prices went up by around 50% – these were boom years for the EPL when it really established its pre-eminence in Europe. These were also the boom years for the UK economy and incomes were growing rapidly. By contrast the BL was not doing especially well in these years, and the German economy was struggling to rein in welfare spending and stop the outflow of jobs into the surrounding economies like Poland and the Czech Republic. Since 2004ish the position dramatically reversed. While the EPL has continued to be strong, the source of that strength is increasingly derived from foreign income and foreign investors. The UK economy fell off a cliff in 2008 and real incomes have fallen by about 10% on average since the peak. Faced with this domestic economic meltdown EPL clubs appear to be cutting average prices in real terms, which would make sense if you want to maximize your income. They may be doing this in ways that are not particularly noticeable (e.g. expanding the sections in which lower prices are charged, rather than cutting the headline price, which might smack of desperation). In Germany, by contrast, there has been a football boom associated with the incredibly successful 2006 World Cup and also an economy that has mostly been thriving despite (some might even say because of) the Eurozone crisis. It is in this later period that average BL prices seem to have taken off. Indeed, they seem to have increased by 45% in real terms since 2004. Two further reality checks. First, there have been numerous fan protests in Germany about rising ticket prices in recent years- involving fans of Borussia Dortmund and Schalke 04 among others. The slant given in the English press is that this is a positive expression of fan power and proves that BL clubs cannot as easily exploit supporters in the way that EPL clubs can. In the light of the table above, a more plausible explanation might be that fans really are feeling the economic pressure of real ticket price increases that are rapidly bringing the BL into line with the EPL. Second, go to any BL ticket reseller website and look at the prices on offer. Prices in the resale market for attractive games can be quoted in the hundreds of euros. This is hardly surprising given the boom the BL is enjoying. So if you were running a BL club, why would you let this profit go to resellers rather than keep it for the club? What is the conclusion from all of this? As the old saw goes, “you can’t get an ‘ought’ from an ‘is’”. In other words, these are just facts, and I hope I have presented them clearly and without any deliberate bias; None of this says whether the BL is better than the EPL (or vice versa) because facts simply can’t do that. But facts presented partially, or incompletely, can sometimes allow an argument to seem more plausible than it really is. I hope the above at least lends some clarity to whatever argument people want to advance. I think we can only compare what is- not what might be. Your point is the same as saying that per game attendance is higher in the BL so if they played the same number of games they would have a higher attendance. Who knows? That would be to compare the real world to a hypothetical world. ‘What is’ is that the EPL is punching well above it’s weight in terms of attendances. The Bundesliga should be well out of sight in terms of attendance & revenue because Germany is twice the size of England. If I was the only bakery in a town of 5,000 people I wouldn’t expect to be as busy as the only bakery in a town of 12,000 people. Hypothetical but true. Stats don’t always give us a full,clear & accurate verdict. Many clubs in EPL are in London = most Tourists. Some big clubs in EPL have relative small stadiums, which creates a shortage of tickets. And makes it possible to sell them for a higher price. Nobody can compare country size. You have to look closer into region, Stadium size. And because of utilization percentage. Last completed season, lower as EPL. Sure but look also into this more closely. Hertha BSC Berlin 74k Stadium and “just” 54k average attendance. Ofcourse this brings down the utilization percentage of the whole league. But the difference is they were relegated last season! And still had a higher average attendance as the EPL Champion. How big of a wealth gap is there among teams in the Bundesliga compared to the fairly large wealth gap between teams in England? Part of the lower price schemes that the Bundesliga might have is that they attract less “football tourists” since their primary viewer base is Germany and other nearby Central European countries. A friend of mine went to the Community Shield in 2011 and paid about 200 pounds, but he said that there was a significant contingent of foreign tourists who were coming to England to watch the match because they were on vacation and had all the money to spend. I’m not saying this happens every match, but clubs pick up on their viewer base and start to charge higher prices. I’ve also noticed over the past two years, Bayern Munich has spent considerably more money on transfers and wages than in previous years. My guess is that, with the current stability that many other BL clubs have, they will start offering higher wages and transfers, leading to a rapidly accelerated rise in ticket prices comparable to England. I realise I’m a bit late, but thought you might appreciate my views as I’ve done quite some data collecting of ticket prices (and attendances) myself. I agree with your basic premise that the difference in ticket prices between the EPL and BL is not as large as the media likes to portray it. After all, while Arsenal indeed asks £62.00 for a ticket for a top category match, they also only ask £26.00 for any seat at the bottom tier at a low-profile match. I also increasingly see clubs offer discounts and kids for a quid offers, which seems to support your outcome that £ per fan has actually declined in the last few years. Bundesliga clubs, on the other hand, seem to have particularly raised prices for seats and mostly so for the top-category matches, leaving standing as the cheap option (which is what English media have been focusing on). It is not easy to find a ticket for Dortmund’s south terrace though. You ask for a conclusion, and I think one is that ticket prices pretty much follow the dynamics of supply and demand. Prices in Germany seemed to have picked up after a generation of new stadiums had been built and the crowds flocked to the stadiums. Prices in England had already done so earlier in the early 1990s, continued to do so in the early 2000s during a second jump in attendances (according to your data), but have stalled recently as clubs find it harder to fill their stadiums (note that few clubs have concrete plans to expand – or only modestly – despite high occupancy rates). It will be interesting to see how ticket prices in Germany develop now that their attendances seem to move down as well this season. I’ve tried to compare ticket prices among countries myself as well just like the Guardian did, but ran into many of the problems that you’ve mentioned (and many more), and it is hard to make a valid comparison (and I’m not even an economist). You’ve compared prices over time, but I think that if you compare both leagues at any given time, you should also take into account the wages of people. These are higher in Germany, which makes the tickets relatively cheaper again. I’ve done this for about 20 countries (building on a similar analysis I found in the Economist) and compared the cheapest available ticket. This is debatable as you point out, but it’s a valid measure of accessibility in my opinion (assuming availability). In any case, I don’t care much about the difference between the EPL and BL, but though it was interesting that Brazil and seating in Argentina came out more expensive than the EPL. La Liga was rather close behind. Thanks a lot for the comment. I think the main point I took away from the data was the degree to which the price dynamics are driven by the condition of the economy in general – this is also not a fact that gets reflected in the prevailing narrative. You don’t mention it but I think you must run http://www.stadiumguide.com, which I’ve just been looking at and is a really cool website on stadiums. That’s right, thanks very much. I had actually hoped to do a lot more with the data I still have lying around (and much more other stuff), but then it always gets buried underneath the pile of other commitments. Really like your blog posts here – great to get some fresh perspectives now and then. In normal countries such as Germany and England, prices go on demand. But in Spain, you have plenty of stadiums half-empty, and the prices don´t go down. I think that is something to analyze. Most businesses are quite reluctant to tinker with their pricing policies – it would be interesting to know just how prices are decided at different clubs.